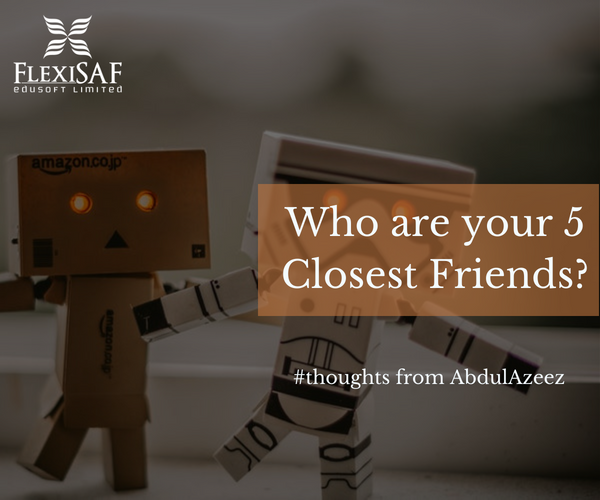 Thoughts From AbdulAzeez: Who Are Your 5 Closest Friends? The people you surround yourself with goes a long way to determine how your life would end up. Are your close allies people that draw you closer to your creator, or people that push you beyond your limit or they are simply the people that bring out the best in you? If your close allies do not fit into any of these categories, then it is time to seek new partnerships. It makes sense that you form relationships that make you a better person because in the end, the goal is to be better than we all were yesterday and if the people we spend our lives with do not give us that, then it is time to find new friends. Understand that having friends is something that is as important as the food you eat since you are essentially what you eat. Same goes for your friends, you are the average of the 5 people you surround yourself with. So look today at the gathering you find yourself and determine if that gathering makes you a better person than you were yesterday. It is not enough to only seek our friends that would make you a better person, it is also important that you think critically and determine if you are also a good friend, because sometimes, like minds attract. If you determine that the people you surround yourself with are people that drain your energy, it might not be about your friends and sometimes, it is more about you as a person than as your friends. So before you begin to trim your friendship circle, take some time to really determine what type of a friend you are and then determine the best type of people we want to relate with. Sometimes, we think the problem is out there but in the end, we ourselves are our greatest threat and unfortunately our greatest resource. And these two, threat and resource does not work together. Be willing to think deeply about the type of person or friend that you are before you consider the circle you find yourself. It is not a bad idea to have very few friends. It is not about the number as it is about the quality of friendships that you keep. Start today by analyzing what type of a friend you are and then move on to determine what set of people would make you a better person. Go out today and do great.